Commercial aquaculture companies in Atlantic Canada are restricted to the use of one strain of North American Atlantic salmon. However, salmon farmers on Canada’s West Coast and around the world have access to multiple strains of European Atlantic salmon. 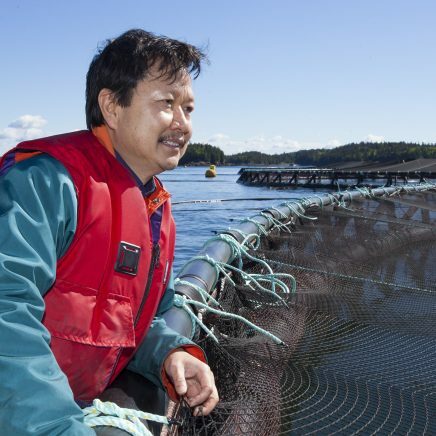 In addition, many aquaculture companies are now incorporating genomics technology into their breeding programs to select for traits that are difficult to improve with conventional methods. Both of these factors place East Coast aquaculture companies at a competitive disadvantage in their ability to develop North American stock that have desirable traits for improved growth, flesh quality and resistance to disease and parasites. Based on this challenge, Kelly Cove Salmon is partnering with Dr. Elizabeth Boulding and her academic group from the University of Guelph to incorporate genomics technology into the company’s breeding program and to develop a new medium density chip for North American subspecies of Atlantic Salmon. Advanced genomics technology known as SNP-chips is already being used by international competitors. When blended with conventional animal breeding techniques, this technology has created a significant increase in survival of salmon at the egg and juvenile stages and has led to better saltwater performance and to a lower cost of production. This project with Dr. Boulding will help Kelly Cove Salmon achieve these same benefits. A previous collaboration between Kelly Cove Salmon and Dr. Boulding resulted in the discovery of molecular markers associated with saltwater growth and resistance to the salmon louse. By developing a medium density chip for North American subspecies and by identifying molecular markers for flesh quality and resistance to disease and parasites, Dr. Boulding and her team will be able to help Kelly Cove Salmon’s breeding program select for traits that will enhance saltwater performance and lower cost of production. This will, in turn, make the company more globally competitive. This project will protect and create new jobs by strengthening Kelly Cove Salmon and its parent company, Cooke Aquaculture Inc., which already employs 1,700 people in rural and coastal Atlantic Canada.